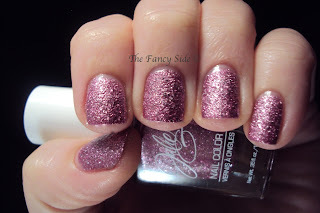 Today I have the last two colors from the Julie G Frosted Gumdrops collection for you. Up first is Sugar Rush. 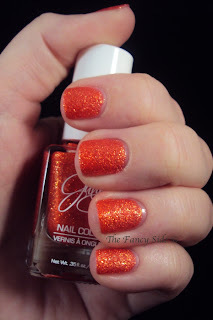 This color is a orangey-red filled with gold sparkles. This one should have been called Hot Tamale, because holy wow...look at that color. At first I thought this color was going to be the exact same as OPI Liquid Sands Jinx. Turns out they are different though, so I get to love them both. Jinx is more red leaning, while this goes more towards the orange. Next we have Crushed Candy. If I had to pick a least favorite from this collection, it would be Crushed Candy. Something about the color just doesn't do it for me as much as the others. This purple color has the same large silver hex glitters and silver sheen that the other cool colors do. Application for both of these polishes was easy. I've done two thin coats for both and waited in between to minimize dragging. Overall, I really love this collection. I'm so happy that I took advantage of the Groupon. That was a big win for me. 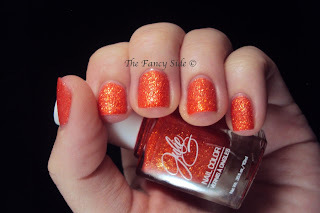 These polishes are wonderfully textured, have great colors, and wear easily. What do you think? Which color is your favorite? I really didn't think they were horrible. No more than a typical glitter polish. I just let the cotton & remover sit on it for a few then wiped it off with minimal effort. You should swatch them soon. I want to see how they look on your tan fingers. It's funny that Cynthia said she complained so much and then haven't even tried them cuz, uh, well... same here. :p I actually am wearing the red one (hot cinnamon?) on my toes, but I haven't properly swatched any of them. I guess after waiting so long and then having two of them broken, and since I just received and swatched all those Zoyas I just wasn't in the mood. I should get around to trying the rest of them because they do look pretty. Especially the orange cuz well, I'm an orange lover for sure. I have Hot Cinnamon on my toes too! They wear like a rock and are so pretty. I still think it blows that some of yours broke. The orange one is great. I want to see a comparison between it and the Zoya one.